The girls and I lay down and stared at the moon and the stars last night, all cuddled up like three little ladybugs, telling stories. We weren’t outside. No, we were laying in Sarah’s bed, staring up at this particular moon and stars you see here. Aren’t they fabulous? This now covers our attic access, which just so happens to be in the girls’ room, courtesy of my friend Gypsy who came for a visit earlier this week. Not the best picture, but the best I could do shooting up while laying in Sarah’s bed! Gypsy, her apprentice Michelle, and I spent two days doing some painting, having some heart-to-hearts and enjoying a sunny Florida afternoon in Fernandina Beach gallery hopping and scarfing down some awesome barbecue at the Happy Tomato Café (highly recommended if you are ever in Fernandina!). Gypsy’s visit was definitely food for the soul for me. Gypsy (otherwise known as Lizz Hundley) is a wonderfully free spirit, making her way in the world while living life to the fullest each and every moment. I’ve been trying to do that more lately, too. In case you haven’t read my comment in my Dodging Curve Balls post, I got good news from the surgeon Monday, so I’m going to be fine for now. Dr. H met with the radiologist and pathologist again and decided that sometimes radiologists and pathologists are a little too quick to recommend further surgery in cases like mine. He wants to wait a bit and re-evaluate in six months. I’m glad Dr. S sent me for that surgery consult as a second opinion. These past few weeks have made me slow down a bit, though, and I think that’s good. Between this little health scare and learning of a friend’s death by a massive heart attack at the ripe old age of 39, I’ve definitely taken a step back from my usual going in eight different directions. When we started the February Finish-a-thon, my “I can do anything” self took over. I definitely didn’t need to add another thing to my plate, but I went ahead and signed on anyway with the goal of creating a new affordably priced pendant line in preparation for the kickoff of the Riverside Arts Market April 4. Well, today’s February 20 and I haven’t made a one. Heck, I haven’t even gotten around to photographing all the new pieces I finished in November and December! My workshop has been sorely neglected. But I’ve decided that that’s really okay (and that seems to be a realization hitting a few of us right now). Yep, I’ve decided that’s just fine because what I have been doing instead? Just hanging out…and I’ve really been needing to just hang out. I’ve been hanging out with DH and the girls…hanging out on the dock looking at the river…hanging out with my furry four-legged friends…hanging out with all the art currently leaning against the walls of my great room waiting for me to rehang it all…hanging out with my students on Facebook (I actually had to learn Facebook for work!). I’ve been moving at a snail’s pace, and it’s been nice. I’ve been keeping up with our running comments on the February Finish-a-thon post. Obviously, since I’ve made zero progress, I haven’t had much news to post, but I’ve tried to be encouraging to the rest of you. I have noticed one thing coming through though. This is truly an incredible group of women, but from my prospective anyway, I think we all have “superwoman disease.” We think we can do it all, and we get frustrated with ourselves, our self-imposed deadlines, and our self-inflicted failures and misgivings when life gets in the way (okay, go ahead and throw darts at me if you think I’m wrong 🙂 ). There’s definitely been some good wisdom in the comments, all from different perspectives, but as I mentioned in one of my comments, something Kristine said has struck the biggest chord with me: “So I’m taking a step back and giving myself a break. I’m taking pleasure in my daily accomplishments and no longer obsessing over what I need to accomplish by the end of the month. It’s a journey, not a sprint.” Yep, it is a journey, not a sprint. I shared a John Lennon quote in my “Keeping Calm and Carrying On” post on my Happy Shack blog last week, and it bears repeating here: “Life is what happens to you while you’re too busy making other plans.” And life in general is the best part of the journey. Don’t let it be what gets in the way; make it what counts most instead. Go live it. I love this post, Kelly, and more than that, I love the fact that collectively, a lot of us have decided to give superwoman the heave-ho. And on another note, I absolutely love the moon and stars and what you’ve done to your stairs. 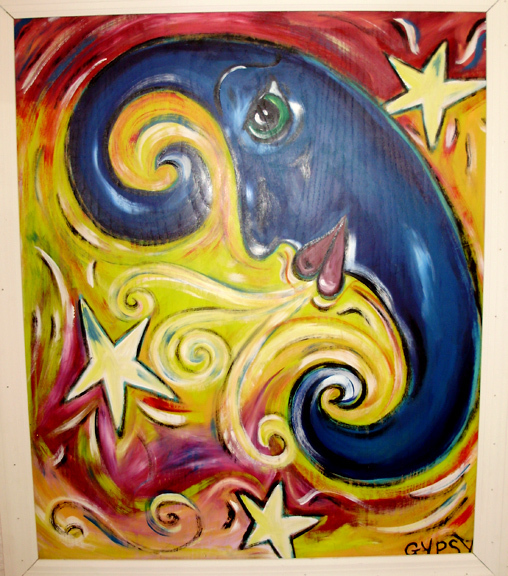 How fun to have a painting party and find fun places to paint the unexpected! I’d like to do that in my next house. I think living in a fun, funky house would be inspiring in and of itself. i agree with brittany on your fun decor! i also agree about taking supermom costume off and allowing for downtime is essential. i love your cartoon images vision, brittany! yet i’ve never been a power suit girl and i don’t carry a dayplanner (i’ve never been able to be that organized!) . the scheduling thing really hits home though. “Mommy must suffer for her art.” 🙂 i guess that’s the point i was really trying to make. if we’re suffering, what’s the point? it should be fun fulfilling, not make us kick ourselves for not completing something. living in a fun, funky house is rather wonderful, i must admit. we are finally getting everything back together after our painting frenzy. the picture of the steps aren’t my steps….yet! 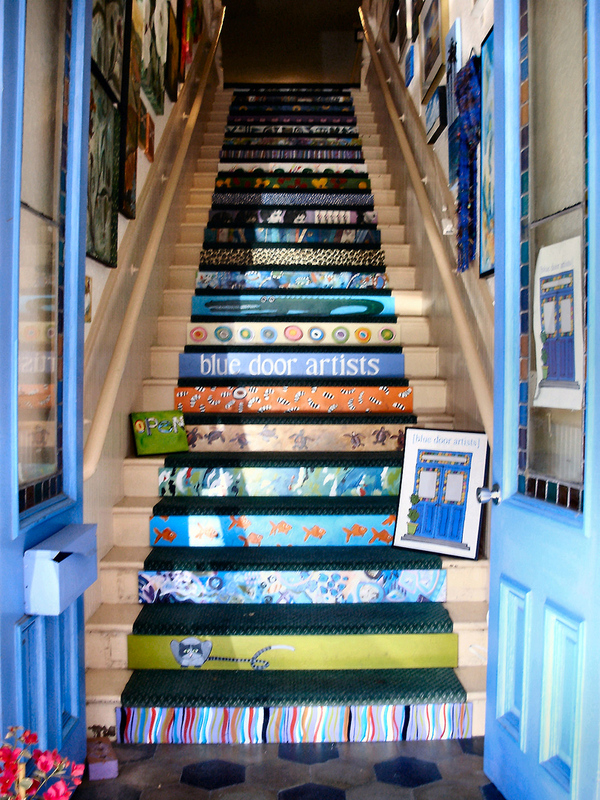 that’s the entrance to the blue door artists gallery in fernandina and what i WANT to do to my steps. maybe by the time you come through in may, they will be done, brittany! cathy, saw your “vent” message on facebook. not having a good day? mine started off with 2 hours in traffic due to road closings for construction and accidents. definitely a monday. hope your day gets better! wow, yet one more message telling me to slow down and smell the roses. just got a call from the wife (nancy) of a dear friend and colleague of mine (ken). ken passed away suddenly this weekend at 59. most likely a heart attack. only good thing to say is that at least he was enjoying life at the time. he was on the golf course. oh no, so sorry, kelly! didn’t you just lose another friend at 39 the same way? OMG. I. MUST. HAVE. THOSE. STAIRS. That is the coolest idea I have seen – I might copy you one day, but it’s okay because we live in different states, right? It’s not like wearing the same dress to a party. It is really hard to realize the precious moments falling all around you, especially when you have people you care about dying and health scares. It sounds like you have really been having a wonderful time, amidst all the chaos. And that is what matters. So very glad to know that you’re in the clear health-wise, Kelly. Terrific, fabulous news. I’ve been thinking a lot about the comments of late; trying to avoid Superwoman complex, giving yourself permission to smell the roses, etc. For me, the problem is not guilt about enjoying myself, or thinking that I (or my kids) need to suffer for my art. It is simply that the logistics of my life are so all-consuming that unless I plant a stake in the ground, my creative time utterly evaporates. This, combined with the fact that creativity and writing are my life’s work, means that for me, feeling like I can’t find the time to be creative makes for a dire situation. I don’t always love the creative work itself, but it is extremely important to me. I don’t want to be someone who just talks about all her big ideas but never sees them through to completion. That will kill me. Maybe my life is just that much more complicated, what with the five kids and self-employment and all, but I doubt it. We all have variations on the theme of chaos in one way or another. I do use a planner, and I would be adrift without it. My brain simply can’t retain all of the important stuff. That includes creative time. If I don’t schedule time for myself — even just a loose target — the opportunity is swallowed up whole by the domestic machine. If I don’t fight for it, it just won’t happen. That doesn’t mean that I’m turning down barbecues in order to write. Far from it. For me, the process requires constantly editing out the activities and events that aren’t important to me — including things that I do by habit that I would do better to avoid. I firmly believe that by aligning your actions with your true priorities results in “enough” time for what’s really important. And I don’t think that the kids have to get the short end of the stick in that equation. Maybe it means not watching TV for a week or two or relying on Trader Joe’s frozen food a couple of nights a week in order to scrounge up some more time. But it’s there, and it doesn’t have to be painful. It simply means staying in touch with what your priorities are. For me, that’s what the February Finish-a-thon is all about. Keeping your priorities in focus, so that when those million other things that need your attention start coming after you, you can say “Not right now — ask me in March.” Obviously that doesn’t mean putting your kids off for a month or missing out on a fun social event. But it might mean giving up a few other things that you actually wouldn’t mind giving up anyway. I think we all have a little “junk food” somewhere in our lives that makes for a relatively easy swap. Just my hat in the ring. hear, hear! or here, here! either way works. I’m coming in late today, and boy oh boy, what a great post and discussion here. My creative writing is what fills the well when the rest of my life goes crazy. It’s my anchor. And like Miranda, I also don’t want to be one of those “all talk and not action” writers. That’s just not me. What I’ve had to learn how to do, however, is to not push myself too hard. Yes, I try to write every day, but instead of setting a deadline of an entire chapter, I’m striving for smaller goals so I can enjoy the rest of what’s in my life, like my daughter and my family and the other things that bring me so much joy. The writing is there, and it’s a top priority, but it’s okay to meet my goal in smaller increments, at least for now. Kelly, I’m so sorry to hear about the passing of both of your friends. Talk about a wake-up call. Thank you for this post. It just shows how truly connected we all are.